I feel obligated to talk about my best friend. Ok, maybe obliged. It feels like an obligation because even though he can't read this or even speak any human languages, he's very important to me. This is actually stock footage of the offense in question: spot stealing. 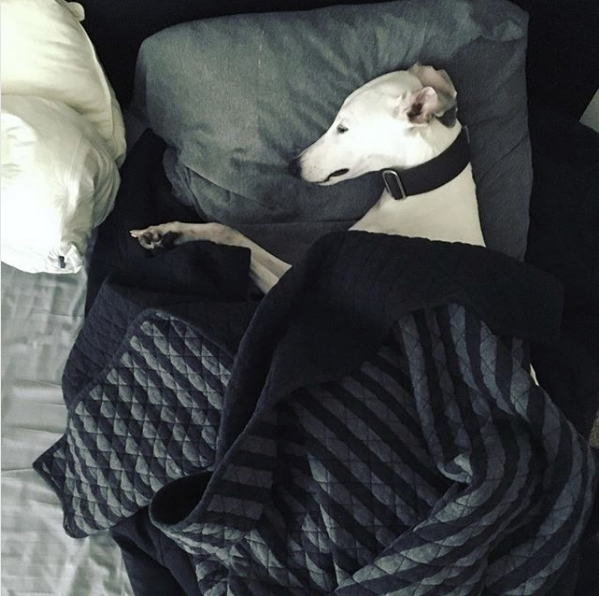 He spent the morning lazily in bed, after stealing my spot... but thankfully, after I'd gotten up. You know that thing where you don't want to move your pets? I'm sure you've seen the memes and comics and I can assure you that it is, in fact, true. And that photo is not posed. He does that. Routinely. That photo is actually from January, about the time we moved. So it was cold. So he wasn't getting out from under the blankets. 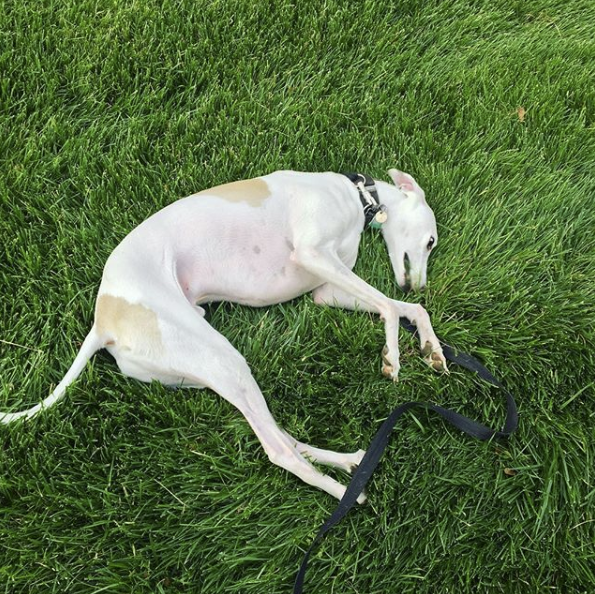 He's a whippet. He has like zero body fat. And he's always been anxious and a picky/slow eater, so even though he's tall for his breed, he's tiny, weighing only about 30-35 pounds. I adopted Ghost about 4 years ago. He was abandoned with a boarding service that a friend of mine was participating in. But only after being abandoned repeatedly for several months, from the accounts we got. His original owner, who likely bought him as a puppy, was trying to move out of the area and had different boarders watch him for a few weeks at a time over the course of a long stretch. When I got him, he was a tiny, frightened and so, so skinny dog. He threw up in the car every time. He barely ate. 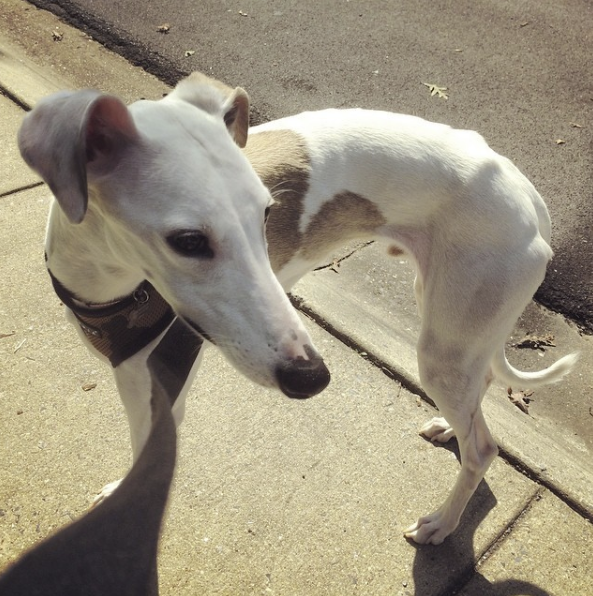 Skinny Ghost, from August 7 2014 - he was probably only about 27-28 lbs then. Fast forward four years, almost exactly, to when I first adopted him. I have learned a ton from this creature. He is a good boy, an excellent hiking companion, a lover of treats and doer of tricks (two of them, and that is it). He's smart. He has tricked at least one human so he could steal food. He listens, he's calm and he's good with other dogs and people. And he's not named after Destiny. He's named after a racing video game mechanic- the "ghost" that follows you when you are in a 1P time trial. Lots of games did it... MarioKart was probably the first where I noticed it, or F-Zero, then Wipeout and so, so many others. He followed me around- I remember thinking in the hours and days and even weeks before all his tags were added to his collar, and still sometimes when he isn't wearing it: "he's following so quiet, just like my ghost". If you want to see more photos of Ghost (and my art, and uh... things that get stuck in and or are placed into trees .. and food, probably... INSTAGRAM!